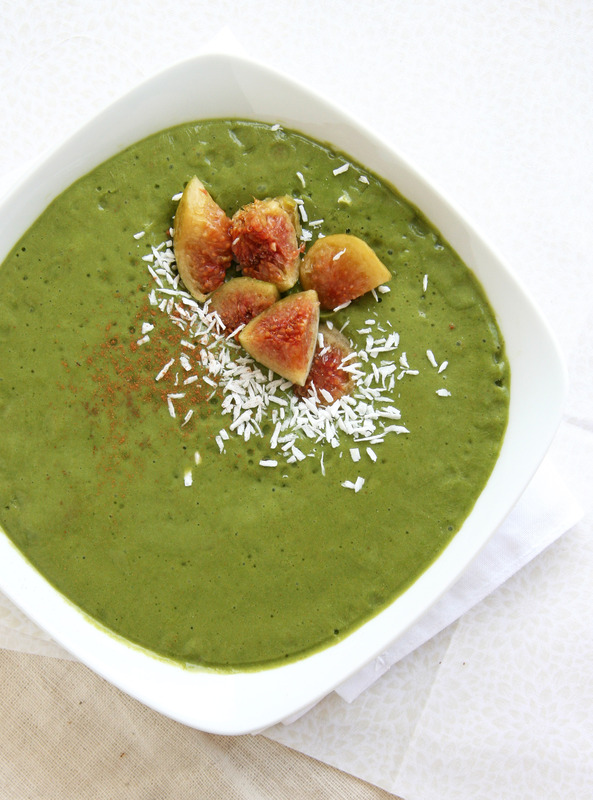 Tropical green monster smoothie…transporting me to an island far far away…aka summer vacation in a bowl! This quick recipe is bright and tangy from the pineapple and mango, with a creamy base from the avocado (or banana) and packed with green goodness from the kale. 1. Add ingredients in the order listed above (avocado through mango) to a high powered blender, and blend for 1 minute until smooth. 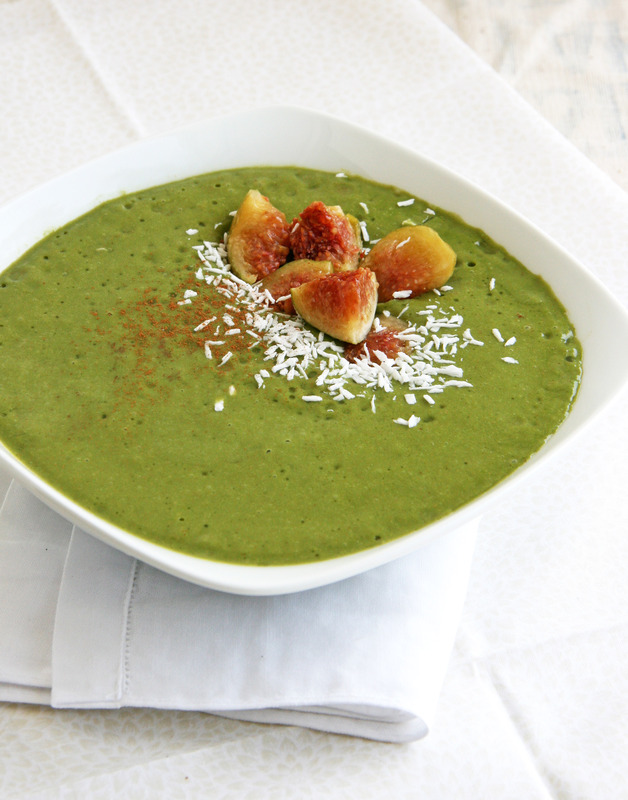 Pour into a bowl, top with chopped fruit, coconut, hemp hearts etc and enjoy! I forget how much I LOVE summer! Sunny mornings and brisk afternoon showers…the grass is bright green and flowers are in full bloom. I sleep with my windows open, and I wake up to the sun peaking in my window and sound of birds chirping…so flippin’ cool. Does that almost sound like an opening to a Disney movie?! Let’s not forget all the fresh produce as well – juicy melons, spicy crisp radishes, sweet cherries and loads of zucchini just to name a few – YUM. I have really been craving fresh foods and cold, refreshing dishes, especially after sitting out in the sun to soak up some Vitamin D for a bit. I’ve also recently discovered my love of frozen figs…yep, frozen ones. They were selling a huge bag of organic green figs at Costco, and I’ve had them stashed in the freezer for a couple months since limiting my fruit intake on my elimination diet. I was craving something sweet and cold the other night, and I thought I’d give these a try on my stomach. Tummy approved and WOW, are they delicious! 1. 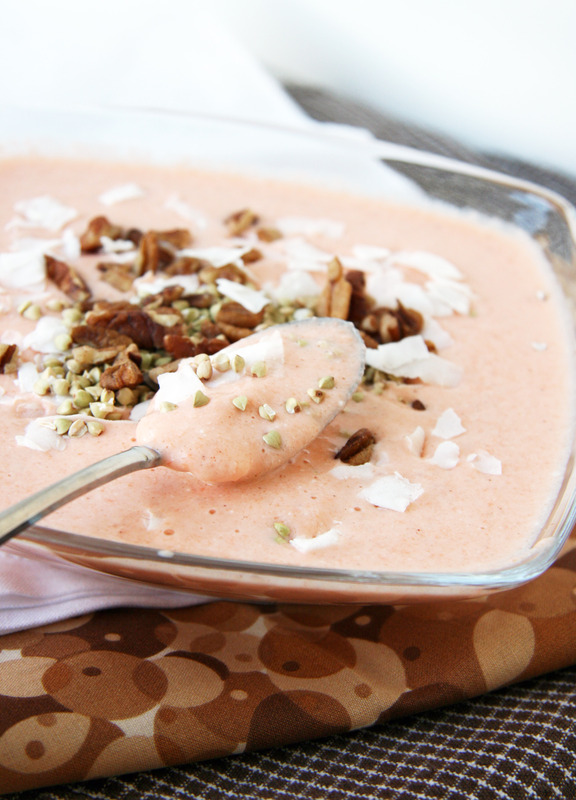 Add ingredients in order as they are listed to a high-powered blender (such as a Vitamix). Blend on high until smooth. Notes: If you do not have a high-powered blender, you might need to let your figs de-frost for 15 minutes or so and chop them smaller OR add more liquid. 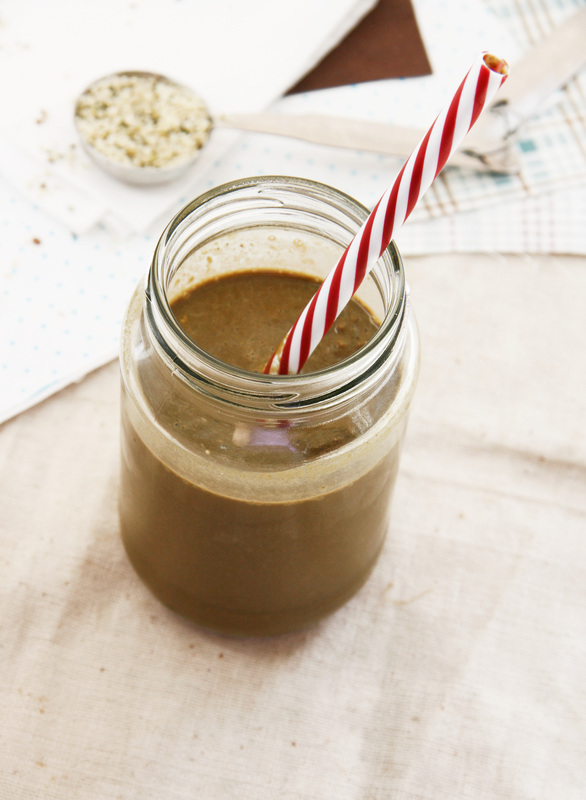 Smoothies are an everyday must-have for me…99% of the time I start my day with a large glass of blended goodness (aka energy surge in a jar), mmmm! 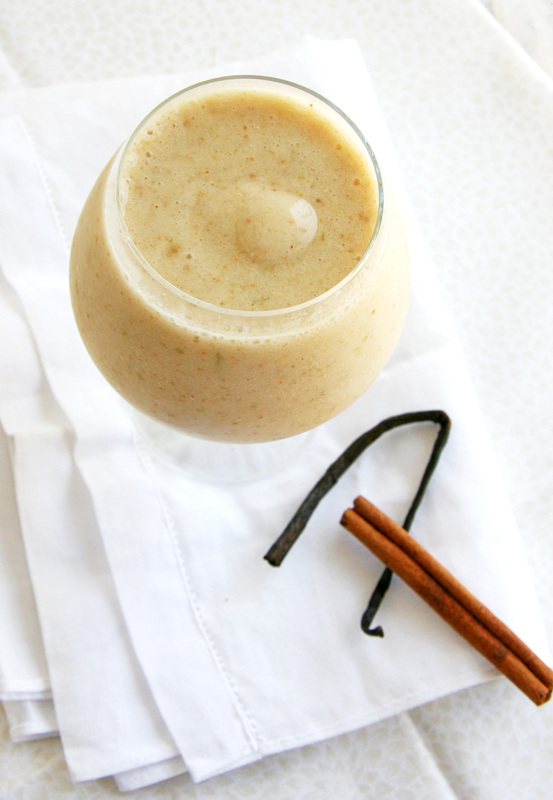 I find that kicking off the morning with a smoothie or fresh juice is easiest on my tummy. Not only does it rev-up my digestion for the remainder of the day, it also squelches my hunger for a couple hours when I have time to eat a more solid meal and ensures that I have at least one nutrient-packed, high-quality meal no matter what the day throws at me. Oh you know, the days when you plan on cooking that new elaborate dish you’ve been eyeing for a while…but (after a longer day than you anticipated), you wind up eating a couple scrambled eggs over quinoa for dinner…or a bowl of popcorn and a leftover energy bar from your purse. Yep, I have had more days recently like the latter than I’d like to admit. 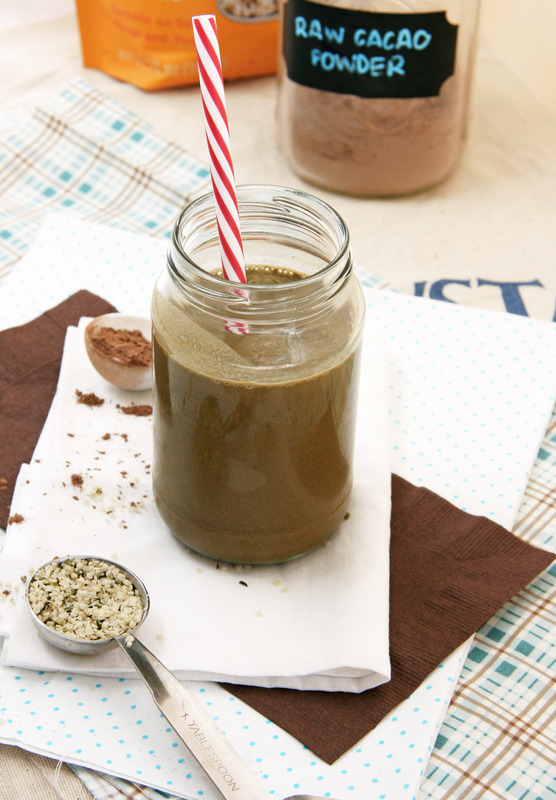 I also realized it had been quite some time since I had posted a drink or smoothie recipe, so when I was assigned Rebekah’s lovely blog Making Miracles for the February’s Secret Recipe Club post…I chose her Hemp Chocolate Protein Shake for this month’s reveal, I was so excited to come across this recipe! I tried to stay true to Rebekah’s recipe…I couldn’t help but add my usual handful of baby greens (kale/chard/spinach) and I wound up soaking the hemp hearts, dates and water in the fridge the night before to soften the dates a bit. The next morning all I had to do was add the remaining ingredients and blend…Breakfast on the go! REWARD YOUR TASTE BUDS: Hemp hearts are delicious, they are nutty, often compared to sunflower seed or pine nuts… only better! Sprinkle on salads, cereal, quinoa, rice, roasted veggies, yogurt, add to smoothies, muffins, breads and other recipes…or eat a spoonful straight from the bag. REWARD YOUR BRAIN: Your brain has many of the fatty acids found in bulk Super Hemp. Regular consumption may help improve your memory. Super Hemp seeds may also help symptoms of anxiety and depression while improving your mood. REWARD YOUR WEIGHT LOSS: Super Hemp is a natural appetite suppressant making you feel full longer. Adding just four tablespoons of hemp seed to your meal can reduce your food cravings significantly. You will also feel more energy which can help you power through workouts and other activities to lose weight. REWARD YOUR HEART AND LOWER BLOOD PRESSURE: Super Hemp seeds contain essential fatty acids that help reduce blood cholesterol. This keeps the heart healthy and also prevents plaque buildup in your arteries. Super Hemp fatty acids also reduce inflammation that can cause high blood pressure and poor blood circulation. REWARD YOUR DIGESTIVE TRACT: Super Hemp provides high amounts of both insoluble and soluble fibers which keep your digestive tract healthy and clean. Super Hemp contains plant sterols and antioxidants helping reduce risk of colon, breast and prostate concerns. Super Hemp does NOT contain oligosaccharides such as found in soy, which often causes stomach upset and gas. Intrigued? 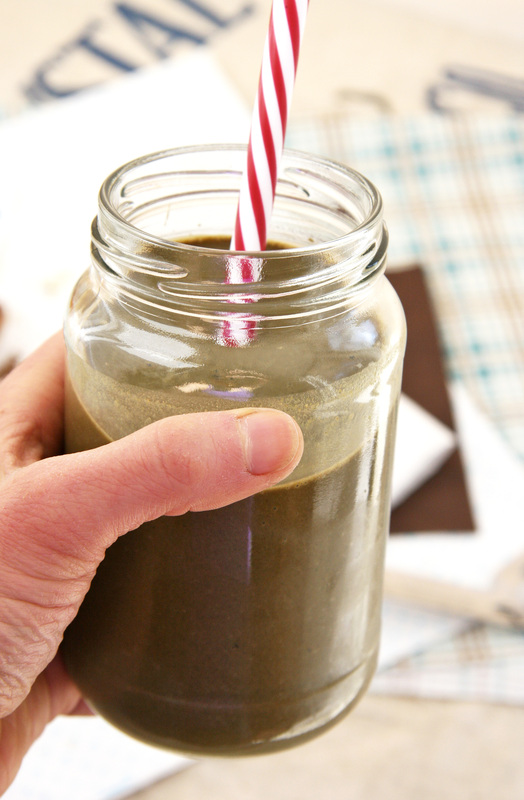 Give this shake a shot! 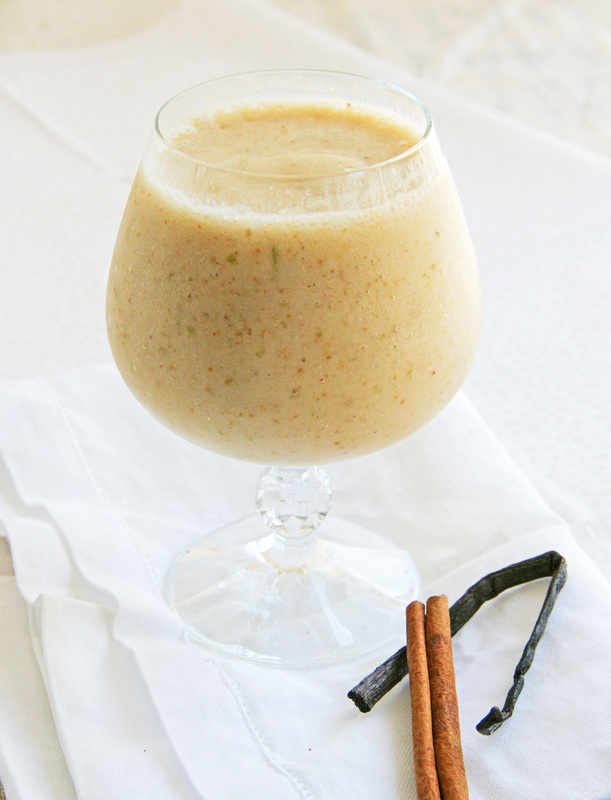 Blend water, ice, banana, hemp seeds, dates (remove any pits), and cocoa powder together in a blender until smooth. Enjoy immediately, refrigerate any leftovers. The night before, combine hemp seeds, dates and water in a jar. Refrigerate overnight. 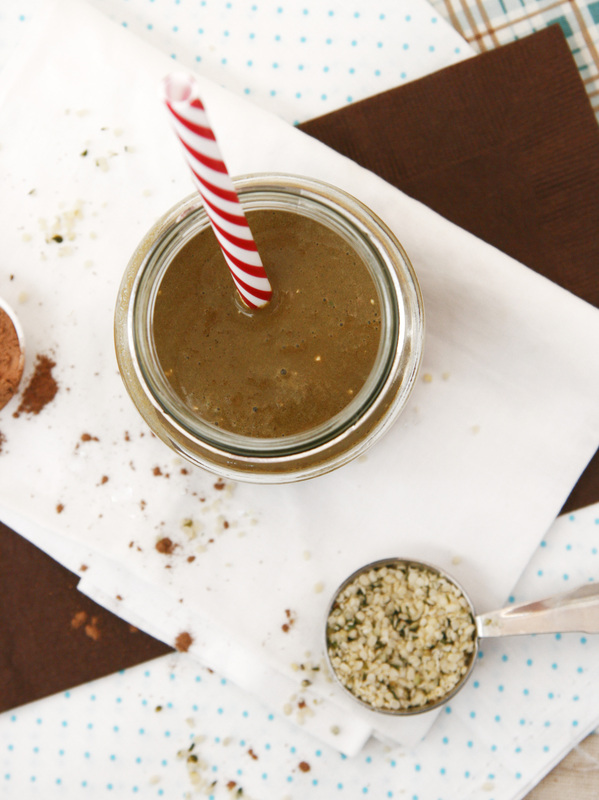 When you are ready to make your smoothie, add hemp/date/water mixture to blender container. Add ice, banana, cacao/cocoa powder and greens. Blend until smooth. For other recipes from this month’s reveal, please click the link below! 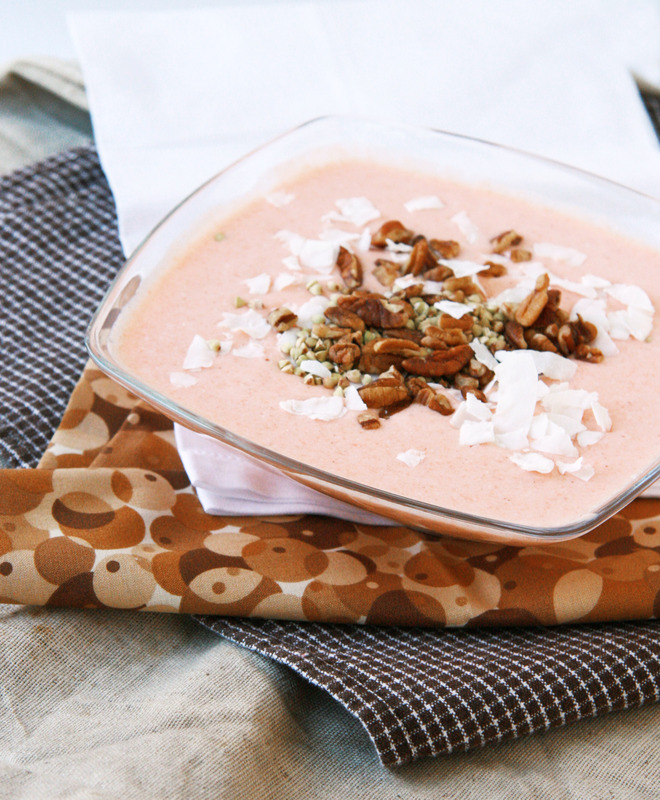 I’ve been loving on my “crunch bowls” or “dessert soups” for snacks or breakfasts. It’s more satiating and longer-lasting than a bowl of cereal with all the texture and flavor that I crave. Lately I’ve been in the mood for carrot cake and warm spices so when I was short on time and had an abundance of baby carrots, I knew just how to use up a few. Too lazy to pull out the juicer (and clean it), I opted for a speedy blender bowl with a carrot cake-inspired recipe! Side note: I had good intentions when I bought a juicer but I have yet to use it since the first few times I’ve pulled it out. I have a weakness for kitchen gadgets but ones that require a bit of cleaning have been set to the side with my schedule these days…excuses, excuses 🙂 My speedy blender came to the rescue, again! 1. 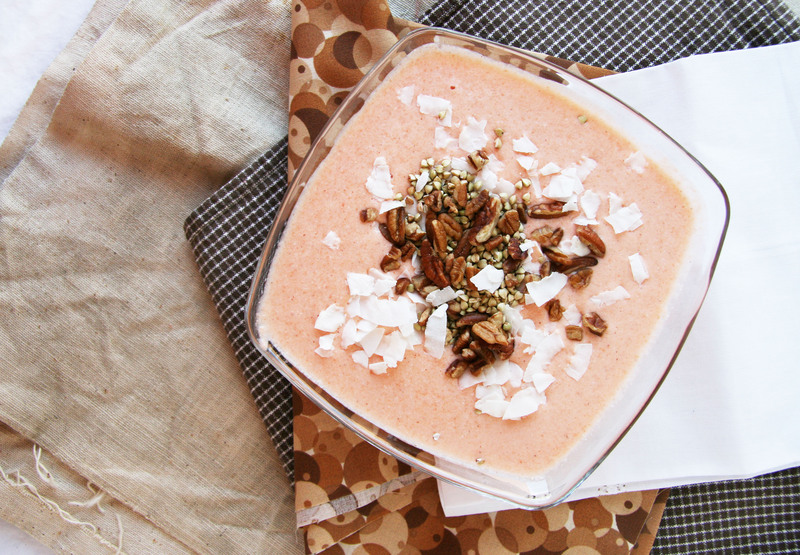 In a blender, combine carrots through ice and blend until smooth, about 1 minute. 2. 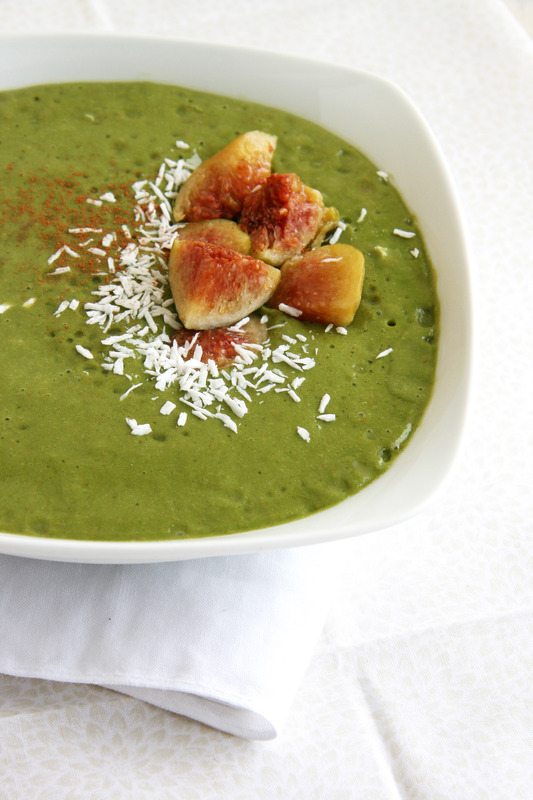 Pour into a bowl, top with buckwheat groats, nuts and coconut flakes and enjoy! Enter your email address to subscribe to Natural Noshing and receive notifications of new posts by email.